The only time I really stank after using the detox deodorant was during the 4th of July weekend when I was forced to eat at a rather disgusting greasy spoon restaurant with family members while traveling. We pulled into the parking lot, and I could smell the rancid oil as soon as I got out of the van. I picked the most benign menu option I could, but the food was terrible. I used the detox deodorant that night, and in the morning I stunk so bad I couldn't stand myself. While gross, a quick shower solved the problem, and I'd rather have the remains of that meal out than in. This to me suggests the detox deodorant was doing its job. In late June 2011, I developed a red, itchy rash on the inside of my knees and on my ankles. I tried all sorts of topical treatments – plantain salve, kombucha, herbal antibiotic ointment, coconut oil – nothing worked. 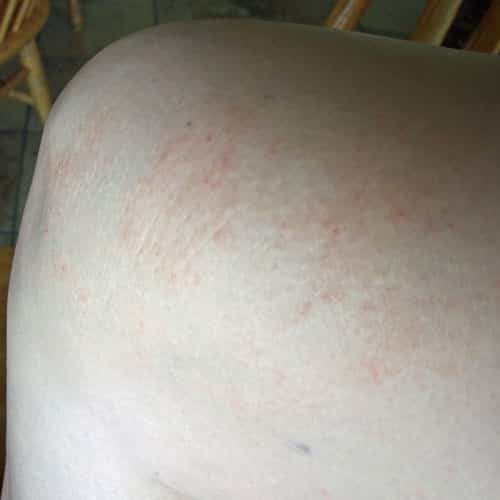 Mike from Herbalix suspected that I might have some lymph blockages in my legs causing toxins to back up and reroute around my knees, causing visible inflammation, i.e., a rash. He suggested I put the detox deodorant on my feet at night as well as my armpits. In a couple of days the itch started to fade, and within a week the rash was gone. I continue to use cold rinses in the shower and dry brushing, but I know my circulation is less than optimal. My knees started itching again this winter, so I started up with the detox deodorant on my feet again, and the itching went away. What are the Herbalix Deodorants Like? The scents of the products are lightly spicy. The Roseline smells like a rose potpourri, the Tropical Cove smells like a cinnamon/spice blend (the boys though t it smelled good enough to eat), and the No Added Scent still have a very light spicy odor because of the natural ingredients. The detox almost has a little Christmas tree action going on (yes, I'm sitting here typing and sniffing my deodorant tubes). I'll bet I'm smelling the rosemary. Beeswax (Cera flava), *Coconut Oil (Cocos nucifera), *First Pressed Extra Virgin Olive Oil (Olea europaea), * Sweet Almond Oil (Prunus amygdalus dulcis), *Cocoa Butter (Theobroma cacao), Shea Butter Sustainable (Butyrospermum parkii), *Coriander (Coriandrum sativum), *Arrowroot (Maranta arundinacea), *Tapioca (Cassava derived), *Olive Leaf (Oleae europaea), *Kelp (Laminaria digitata), *Rosemary (Rosmarinus officinalis), and Herbalix™ Organic Preservative. Beeswax (Cera flava), *Coconut Oil (Cocos nucifera), *First Pressed Extra Virgin Olive Oil (Olea europaea), Shea Butter Sustainable (Butyrospermum parkii), *Safflower Oil (Carthamus tinctorius), *Cocoa Butter (Theobroma cacao), *Palm Oil (Elaeis oleifera), *Arrowroot (Maranta arundinacea), *Tapioca (Cassava derived), *Sweet Almond Oil (Prunus amygdalus dulcis), *Jojoba Oil (Simmondsia chinensis), Rose Essential Oil(Rose damascena) and Rosewood Essential Oil (Aniba rosaeodora) *Avocado Oil (Persea Americana), *Rosemary Essential Oil (Rosmarinus officinalis), and Herbalix™ Organic Preservative. I find the texture of the Herbalix deodorants to be similar to a hard lotion bar. They are a bit oily rather than pasty like a standard commercial deodorant. It's best if you apply them and wait a few minutes before getting dressed, so that the oils have a bit of time to soak into your skin. With extended use they may produce oil stains on clothing, but I've only found this to be significant the nighttime detox staining my socks and jammies, partly, I'm sure, because I just slapped it on and crawled into bed. As I mentioned above, Herbalix products are formulated to heal, not just act topically. They've been conducting studies using thermographic imaging, and they now have photos demonstrating that their products help remove blockages in breast tissue. Update – View a demonstration of how Herbalix Detox Deodorant was used by a patient to help clear breast cysts. The products are manufactured in the United States, in a facility with manufacturing equipment that has been specifically refitted to be 100% stainless steel. At no time does the product come in contact with any plastic piping, solder or other potential toxins. How Do I Know If I Need a Detox Deodorant? 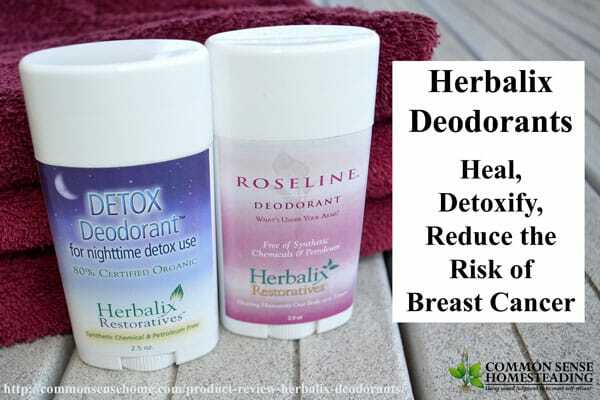 My personal opinion in that nearly everyone could benefit from the use of a detox deodorant. Most people use aluminum based deodorants, and I firmly believe that these are potentially harmful. Studies have found increased levels of aluminum in cancerous breast tissue, and the majority of breast cancers are found in the quadrant of the breast closest to the underarm area. I don't believe these things are a coincidence. I highly recommend these products and trust this company. I have purchased their deodorants and Smart Salve for my family and for my siblings. I have become an Herbalix affiliate, which means I receive a small payment if you make a purchase through my link. All opinions expressed here are my own. If you have any questions, leave a comment below or contact Herbalix directly – they also have great customer service. You may also want to check out some of their skincare videos, which explain why they do what they do in a lot more detail. I had no idea that coriander could be used to bond with metals (such as aluminum), or the differences between natural and refined beeswax. Originally published January 24, 2014, updated October 22, 2015. This was really helpful. I am looking for a deodorant but found that deodorant really only masks odors, but even the antiperspirants contain aluminum so Im going to try to give this stuff a shot, make my own, or stick to baking soda which is rather messy but works! Thanks again for the review. The deodorant acts like a poultice until it is washed off. There are ingredients in the deodorant that bind the material being drawn out of the pores. You generally can’t see the toxins, but you can see the results of their removal in the post “Cure Breasts Cysts”, which has thermographic images of breast tissue of someone using the detox deodorant over time. Yes, clothes will get soiled with extended use from the oils and herbs used in the deodorant. Yes, it is a good idea to wear some sort of clothing to bed while using the detox deodorant. Cotton t-shirts breath well and are inexpensive. I buy men’s x-large tall t-shirts on clearance and use them as nightshirts. Laurie….have been reading some of your interesting info. I have fibrocystic breasts and have been reading a little about using iodine to help. Have you done any research on using iodine? I know iodine is critical to both thyroid and breast health, and that soils away from the ocean are often low in iodine, and that bromated vegetable oil and flours are very common and are a problem because the bromine displaces iodine in the body. Susun Weed goes on in her way in the book Healing Wise about the benefit of various types of seaweed to women’s health, but it’s been several years since I read that chapter. There’s a lot of conflicting information about whether or not to supplement with iodine and how much of what type to use. For right now I stick to natural keep or nori, and make sure to get enough selenium with it, because of my Hashimoto’s Thyroiditis. I know excessive iodine can worsen my condition, so I haven’t looked to add large amount of it to my diet. I am curious about what ingredient(s) have a detoxing action. Is it just the lack of aluminum and other toxic ingredients that allows the body to detox itself, or is there something specific to the product? Thanks! Jill – I’m sure the folks at Herbalix could answer this better, but my understanding is that the product pulls toxins from the body and binds them so that they can be washed off. I know the coriander has an ability to bond with metals. I believe the seaweed and olive leaf also aid in the detox. Hi Jill-The detox deodorant formula contains “salt” in the form of seaweed, a higher form of salt. Seaweed creates a slight dilation in the sweat ducts and allows the weaker salts (alums) to exit the lymph by osmosis and to be drawn to the surface of our skin or axilla (armpit). The coriander seed binds these alum salts and prevents them from being reabsorbed back into the body. The classic explanation for this is that our bodies are less salty than sea water. Weaker salts are attracted to stronger salts; whereas antiperspirant salts (alums) are weaker than our bodily fluids and will be drawn into the body. In addition our preservative has other ingredients which add to the effectiveness of this process. Thanks for explaining this in more detail, Mike! Would this be dangerous to use if you had a problem with mercury or copper? I know detoxing from those is tricky. Kristie – I don’t believe so, because the process works very slowly and gently, and the toxins are pulled out of your body and washed away, not released from the tissues into the bloodstream or digestive tract like some treatments. There are ingredients in the deodorant that pull the toxins out, with others that bind to the toxin so they can be washed away. before thinking of trying these, i’m curious what the organic preservative is. Susan – I *think* it’s a sea vegetable blend, but I’ve let Liz know that the post is live and hopefully she’ll chime in when she has time to answer questions. I know they’ve spent years of research on their products, and spared no expense in sourcing quality ingredients and rebuilding their equipment so it’s all stainless steel – no rubber gaskets or plastic. They’ve got a lot of information on their site. Raven – I suspect so. I will double check with Liz at Herbalix. “For most of us itching is intolerable and we want it to go away however on another level it can be seen as a healing effort where the body is excreting something that can no longer be held within the body. Homeopathic practitioners view itching as a healthy reaction and have remedies which assist with the underlying constitution which is expressing the itching. A common homeopathic remedy is Sulfur. It is best to consult with a knowledgeable practitioner. Standard medical practitioners will use an insecticide “poison cream” to kill off the mites that cause scabies. Scabies is extremely common and cycles through communities and can affect even persons with excellent hygiene. Once the mite is killed the itching continues on for a period of time. The chronic hives community has tips for itching which include avoiding foods high in histamine so it is wise to avoid fish, pork, lunchmeat. Scientific research supports the notion that the cell membrane releases histamine and that we can stabilize the cell membrane with proper intake of parent essential oils like pumpkin seed oil. Look for organic high quality oil. The dose is 1 tsp twice daily. Topical moisturizers like the Supreme Solution are helpful. The Supreme Solution also contains pumpkin seed oil. Michelle, I would suggest contacting Herbalix directly with your questions. I would think that it would be a possibility, depending on the medication, but unlikely for most. Do you have to use both day and night, or can you just use one or the other? For detoxing, it’s just the Detox Deodorant at night. The day time deodorants are optional – you just want to make sure you avoid using something with toxic ingredients. Thank you. One more question. I saw on their website they had a detox soap. Would it be to much at one time to use the detox soap and deordorant? The soaps are not a detox product, only gentle, non-toxic skin care. Just to let you know, the bars are similar in quality to the hand made bars a friend of mine makes, and will soften with use. It’s best to use a soap dish that lets them dry between uses, otherwise they will get mushy and be gone very quickly. Ahh you are right. I miss read. I’ll let you know when I try them! I’m not clear on why the product is manufactured in solid steel pipes and never comes in contact with plastic only to be packaged in plastic. Is there an explanation? My guess would be that the manufacturing process requires heating, and temperature changes (especially heating) are what trigger the breakdown of plastics and release of potentially harmful compounds. Think tupperware in a microwave. At room temp plastic is stable, light and resists breakage, making it a practical choice for product storage and shipping. I just received my deodorants and soaps today! Tonight was the first use of both, not sure how my hair is going to handle the bar shampoo, do you use any type of conditioning product on your hair? Ready to get this skin detox going:) Thanks for all the info on the product! I don’t use a conditioner. I’ve been washing my hair less frequently (I used to be a daily washer) and use just a dab of coconut oil on the ends if they get dry. I’ve noticed that since I changed my diet and added more healthy fats such as coconut oil and butter, my hair is much less frizzy. I love Lavilin. It’s all-natural and comes as a roll-on and as a cream. Roll-on is less maintenance so I prefer that. Buy it on Amazon. Just started reading about the Herbalix-Detox and am excited to try it out. My questions is, can I continue to use the my regular daytime deodorant “Crystal”? Is Crystal consider a toxin free product? There is some possibility that the aluminum in crystal deodorants may penetrate the skin, and some synthetic crystal deodorants are manufactured from byproducts of the heavy metal industry in China. The article “Non-Toxic Deodorants” explains in more detail. I have been searching every where in Michigan for this products. The company website listed stores in Michigan that carry the deodorant but when I called each one of them, they all said they no longer carry it because it didn’t sell. I’m a little discouraged about this. I even called out of state and could not find anyone that sale the deodorant. I would think, if it worked as well as stated, everyone would be buying it. Is it selling anywhere other than online? I’ve now stopped using the crystal and am using coconut oil and baking soda. But still wish I could get my hands no this deodorant to find out for myself if it works. I think their big problem with market penetration is simply their price point. 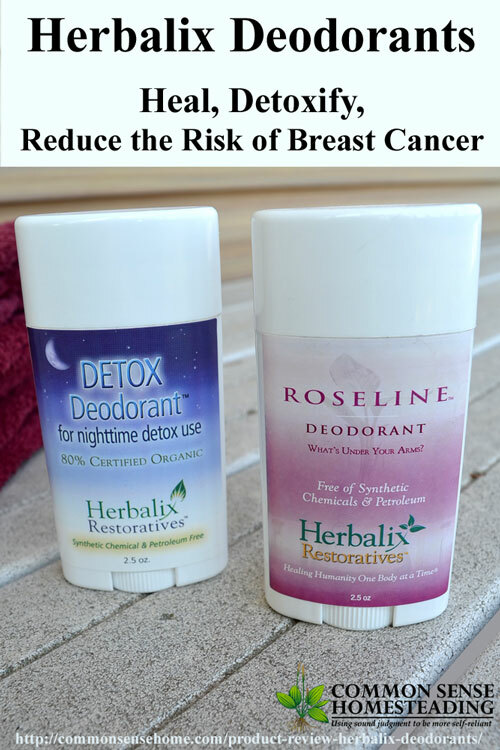 It’s significantly more expensive than most other deodorants on the market, and most people are not willing to pay that kind of money, unless they know for sure they have an issue that can be addressed by it, like breast cysts. Shelf space is very competitive, and retailers want a product that will turn over quickly. I like the product, and have seen the results it can give, but I’m afraid it will continue to be a niche product unless they can drop the cost. It’s always available directly from the website. I believe you’re right about price making a difference. I’m going to try it anyway and will let you know if it works for me. Thanks.